Today is Friday, and I'm changing Fun Friday up a little! The Older Folder will now replace the Interview for the first thing in my Fun Friday. The Older Folder will show pictures from Private Beta, Open Beta, or older than that! This weeks picture is when Open Beta began and all Private Beta users, or TinkaTesters, got a badge for helping. The idea came from Johannes. The mysterious staff member who looks like a tree. He first interned with Luke and I at UOVO when he was 15. 5 years later we hired him at Tinkatolli to help fine tune the mini-games and give us feedback on the overall game. He studies physics at the university now. Is VERY smart and knows a lot about computer games. Right now, Johannes, or Jlitcht online, doesn't come on from day to day. But we are all very glad that he made him up! Also, way back in TinkaTesting, when nobody knew when trader came, or where he was at, something strange happened. I refreshed one day to find a weird message, take a look at what I mean. 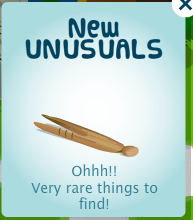 First, I thought we were having a new hunt, since this was the same pop-up that came up for the eggs in the egg hunt. 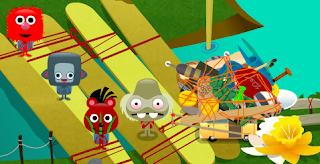 But then I made my way around the island and found Trader at canopia! When I asked him about the new unusual, he said "O, yea, dat is fo you to find for meh." So I clicked him and saw he DID need it. PLEASE comment or tweet (@DuksterDude_Win) if you have a picture that I can use for the Older Folder, and/or a question for next weeks Fun Fact! Click here to look at the other Fun Fridays! NEW TINKA GUIDE! 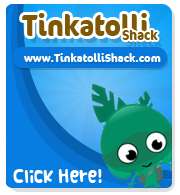 Find out amazing facts about Tinkatolli! Tips Points = Win in-game rewards! Bulletin Board at Blueberry Hill! 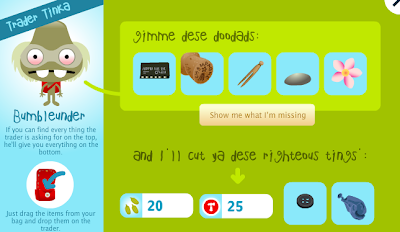 TinkaTolli St. Patrick's Day Updates! New Authors and Testers announced! Template made by Gelu. All rights reserved!